Anyone else have a noisy press? I've got some definite "crackle" on parts of Phantom, which does not seem to be static. Broadcast's first release on Warp is a collection of singles and other b-sides from their singles on Duophonic. The tracks are a homage to the underground pop sounds of the 60's, with Moogs buzzing around in the background while Trish Keenan half sings and half speaks to great effect. Though the songs sometimes sound a bit too rough, this is a hidden gem in Warp's discography. This is a strange record. At first sight it sounds like an early 70s rockband played here like The Doors or Velvet Underground. But the production skillz and instrumentation tell a modern thinking of these roots. Great record for friends of Air or Portishead. 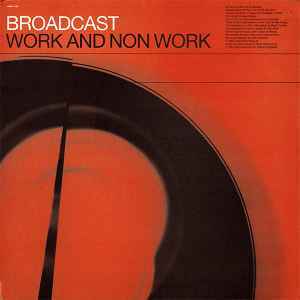 Broadcast’s first album, <I>Work and Non Work</I>, is actually a compilation of early singles and EPs. It’s a wonderful introduction to the band and their unique sound. At once emotional and icily cool, the band’s combination of Trish Keenan’s high vocals and harpsichord-like synths becomes something beautiful and fractal. Their use of off-kilter melodies and modal harmonies crashed into a distinct pop sensibility is evident on “Messages From Home.” Eerie cinematics comes to the forefront, as well, on instrumentals like “Phantom.” Broadcast’s lyrics are actually of worth to listen to and complement the music hand-in-glove; listen, for instance, to the plaintive longing of “Lights Out.” It’s the thinking person’s pop music.